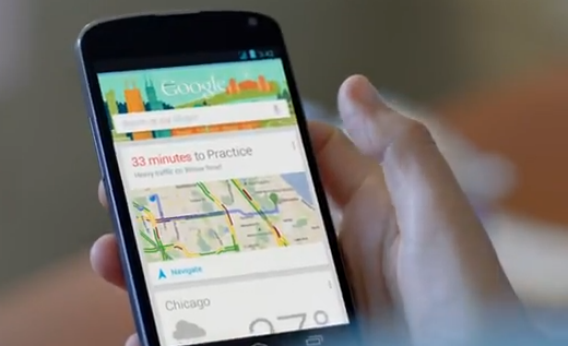 Google Now: Nexus 4 Grammys ad shows future of smartphones. Google’s personal-assistant software can combine information from your calendar with information from the Web and its maps app to tell you when to leave for an appointment and what route to take. Finally, a Google phone ad that emphasizes the Google more than the phone. During Sunday night’s Grammys telecast, Google aired a new spot for its Nexus 4 smartphone that highlights how the company’s battle with Apple is shifting from the realm of hardware and apps to the that of artificial intelligence. The ad hardly shows the device at all. Instead, it focuses on Google Now, the search giant’s answer to Siri. I can ask Siri when my next appointment is, but she can’t help me plan the best time to leave for that appointment. She can’t even tell me if the train is delayed. And if I ask for the fastest train route to Union Square, I’m sent to Maps, and then directly into the App Store to buy some transit apps. This may or may not be crucial to the future of smartphones, which have large enough screens that you can achieve most of the same results without too much fuss by tapping on a couple of apps. But it is almost certainly crucial to the longer-term future of mobile computing, a category that is already beginning to expand beyond phones to include smart watches and smart glasses. Imagine having to toggle between your calendar app, your maps app, and an app that keeps track of the latest train schedules on a wristwatch and the significance of Siri and Google Now starts to come into focus. This is why Google recently hired the famous artificial-intelligence researcher Ray Kurzweil. It’s also why Apple felt it had no choice but to build Apple Maps. In short, the new Google ad serves notice that the mobile personal-assistant wars have begun.